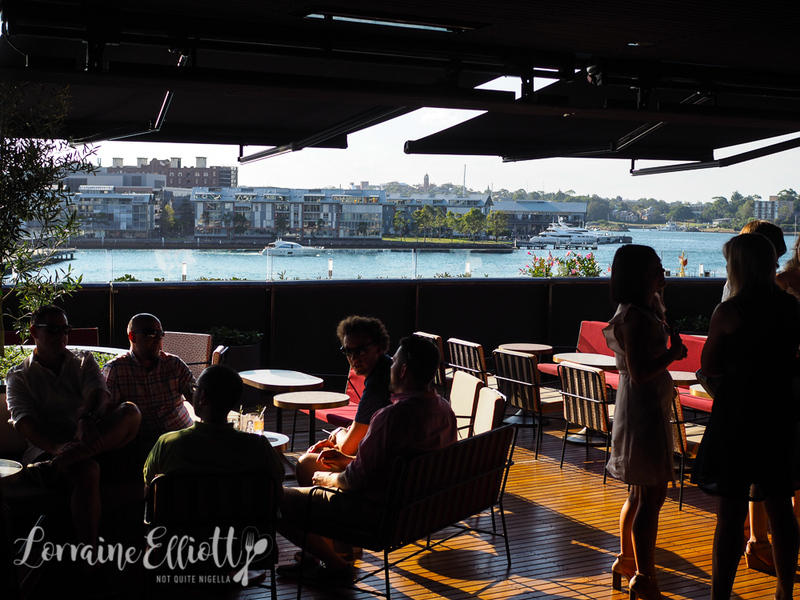 Barangaroo House is the impressive looking three tier building on Barangaroo's waterfront opened mid December 2017 by chef Matt Moran and the Solotel group. The building's house bar is located on the ground floor in the wrap around outdoor space. On the first floor is Bea the 180 seater restaurant while the second floor houses Smoke, a bar with a neat snack menu. My favourite sort of Saturday or Sunday night starts around 4:30pm. Sydney has bestowed us a sunny, brilliant day with a gentle breeze and Mr NQN and I swing by to pick up Ivy and Ryan for the drive to Barangaroo. We arrive and it is bustling. "So where is it?" 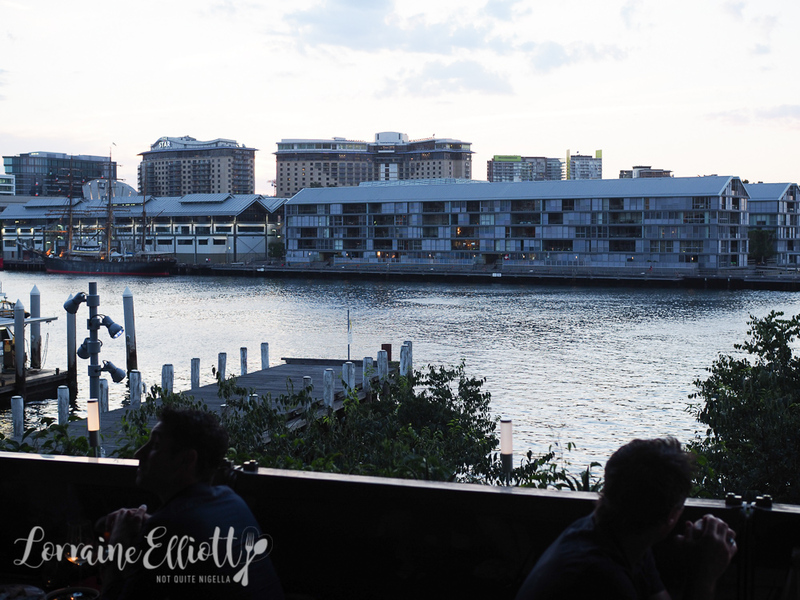 asks Ivy and I confess I have no idea where it sits within the Barangaroo development. You needn't look very far though with the enormous building looming above. 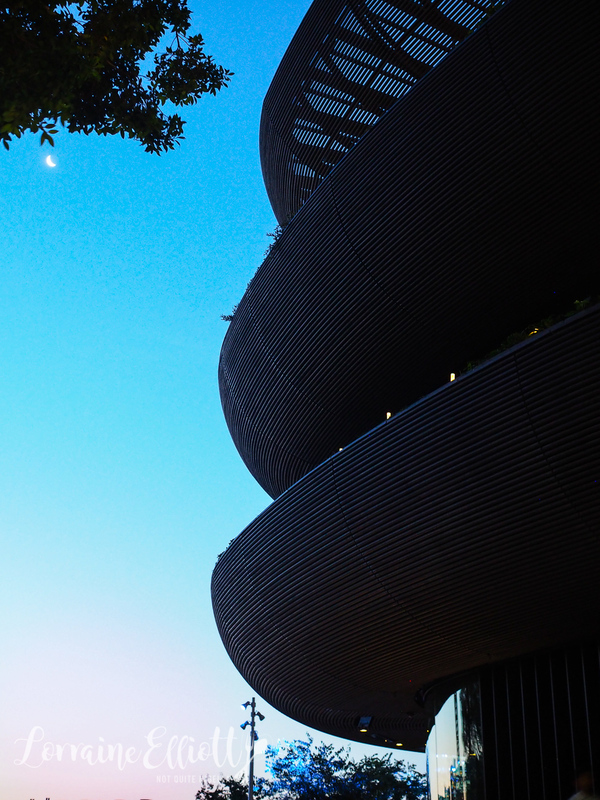 Said to be designed to look like three bowls stacked atop each other it has been three years in the making. They direct us to our first port of call, Smoke on the 2nd floor. All the tables outside are taken although there are some sun drenched spots. We have a booking at Bea at 6pm so we sink in a lounge and have cocktails and something to nibble on. 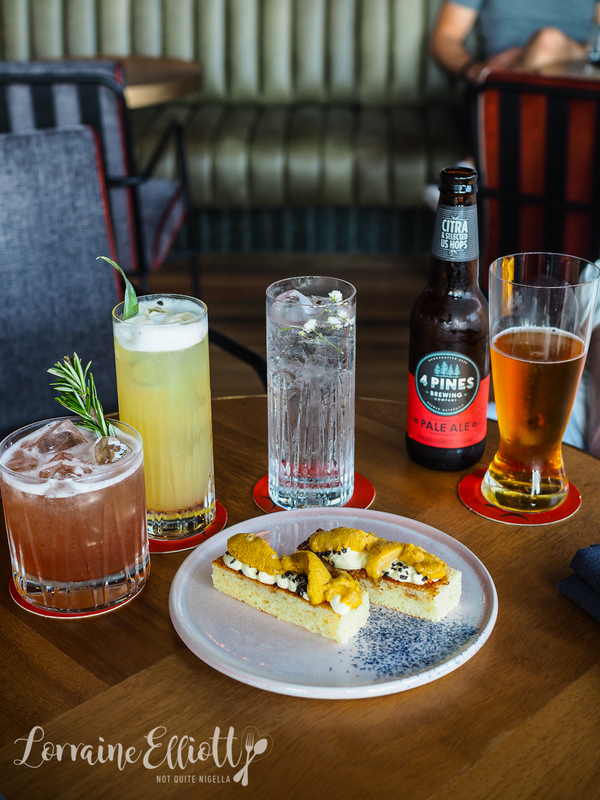 When trying to decide whether to go to Smoke or Bea we decided on dinner at Bea and pre-dinner drinks at Smoke as Smoke doesn't take bookings and we figured that getting a table at 4:30pm might not be too hard. 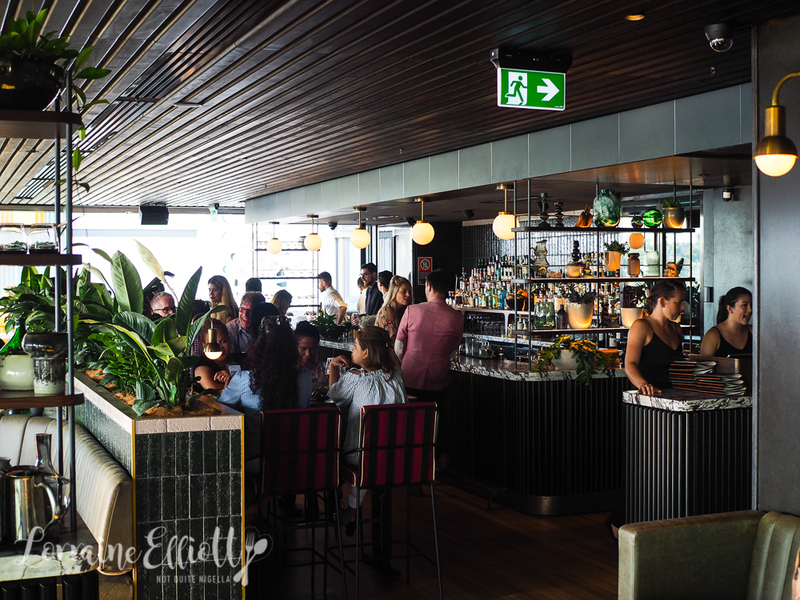 Service is friendly and there is table service but you do have to leave an ID and a credit card behind the counter which seems strange for an upmarket venue. Our waitress says solemnly with sincere, doe eyes, "You wouldn't believe how many people leave without paying." It's Christmas time and cocktails are in order although they are at any time for me. I really like my Maho beach cocktail with Bacardi Carta Blanca, Licor 43, toasted almond, pineapple and lemon. Ivy loves her Seasonal G&T with Archie Rose gin, cucumber, grapefruit oils and Fever-Tree elderflower tonic while Mr NQN enjoys his Smoke ‘n Screens with Espolon tequila, smoked agave, lime, cherry, smoked rosemary with its light touch of smokiness. Ryan orders a Four Pines beer. Ivy spotted the beef brisket doughnuts prior to our visit so naturally we had to try them. Ivy and Ryan are from the South of America (Atlanta, Georgia, shug) and she and Ryan love their brisket and will drive for hours to try one. 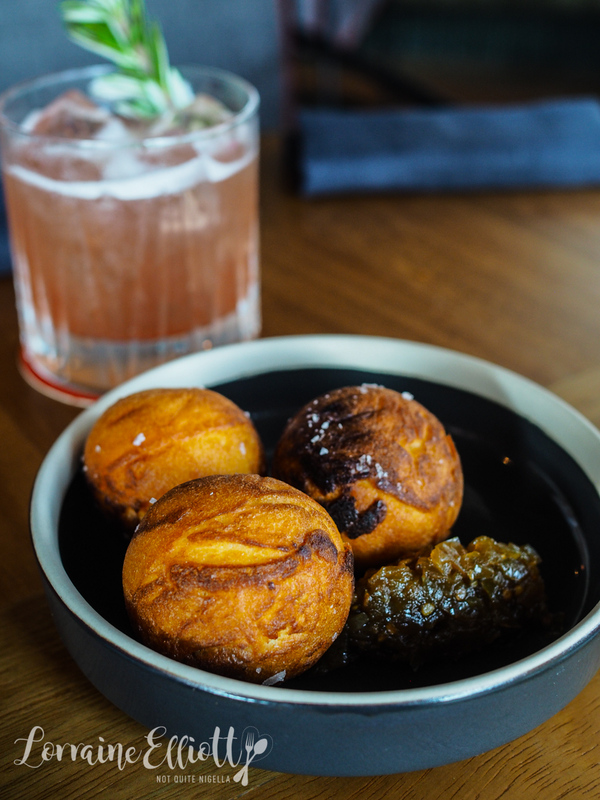 The donuts come three to a serve with a green tomato jam. They're generously filled with beef brisket with almost a cornmeal type of outer. They remind me of a cross between Dutch Oliebollen and takoyaki filled with soft brisket inside. My eye wandered straight to the sea urchin on the menu. Ivy tells us that she has never tried sea urchin before but is curious about it so we order the sea urchin toastie. 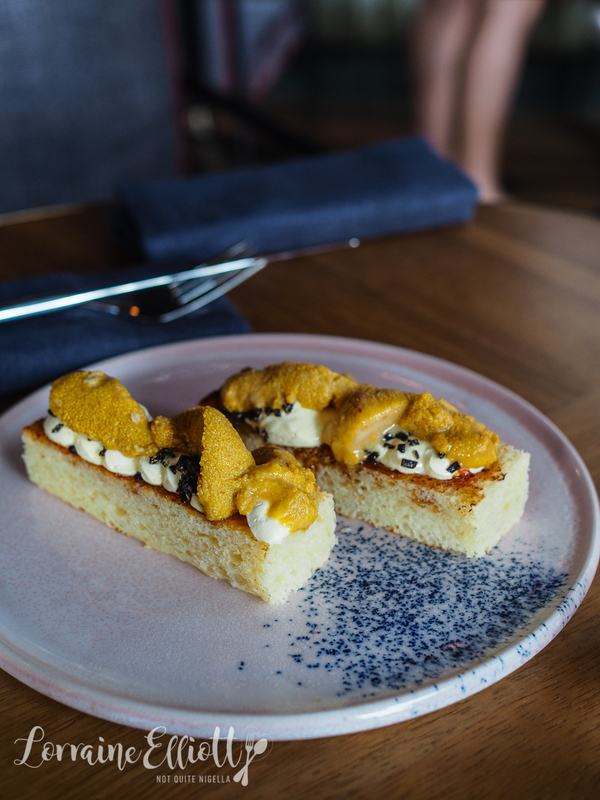 It comes out on two slices of toasted brioche with whipped butter and plump, goose-fleshed sea urchin on top. This is my favourite snack and after Ryan bypasses his piece and offers me his I happily accept. As for Ivy she tried it but it was a hard no for her. But we're still friends because she doesn't camp or rough it and hey you've got to stick with those that understand you. We order another round of drinks before heading downstairs to Bea. 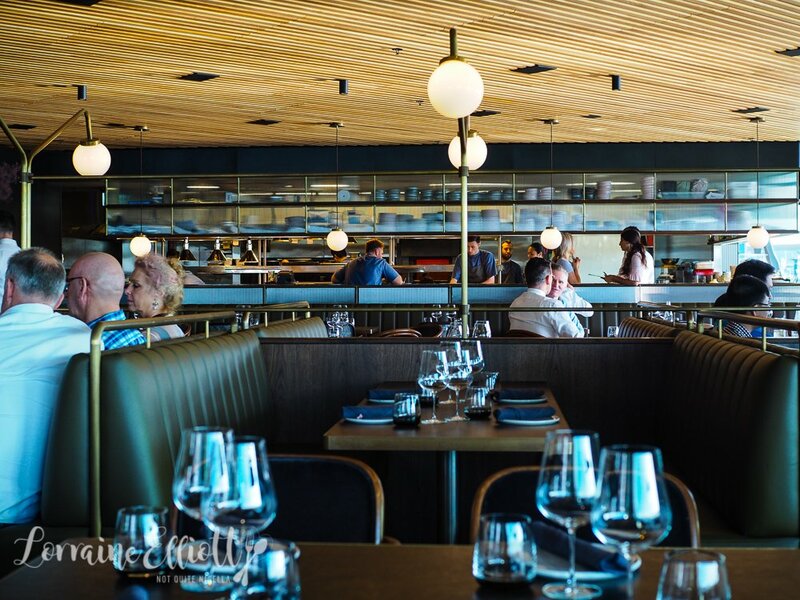 The space is expansive and beautiful with tallowwood floors, timber and leather table tops and ash flecked ceramics. We are shown to a booth near the window (tip: bring sunglasses) and there are outdoors tables as well. Chef Matt Moran is standing at the front talking to some people and the multitude of staff are busy milling around. 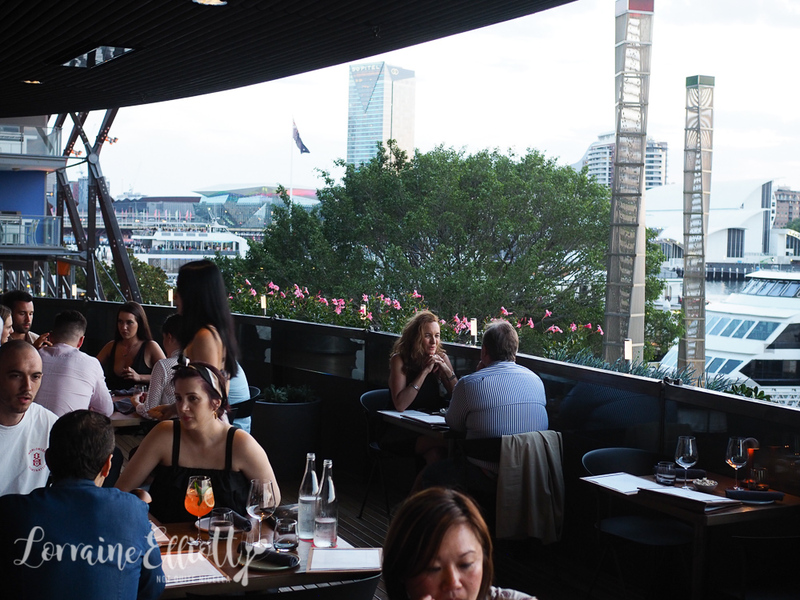 The head chef is Cory Campbell formerly of Vue de Monde and Noma who describes it as "fun dining" over "fine dining". 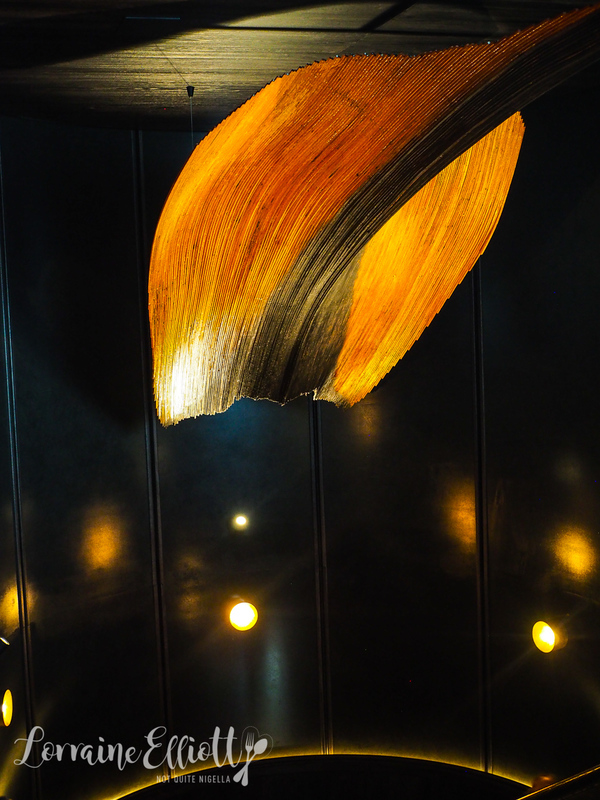 The menu features quite a few dishes with native produce and descriptions are kept deliberately vague. We are offered the service of the junior sommelier who is more than happy to recommend wine. Our rather nervous and soft spoken waiter brings our menus. When I ask him for recommendations he doesn't really recommend a lot of items and sort of disappears. I feel like I've asked him something highly inappropriate. He came back with the first plate, a steak tartare and then left it and ran. 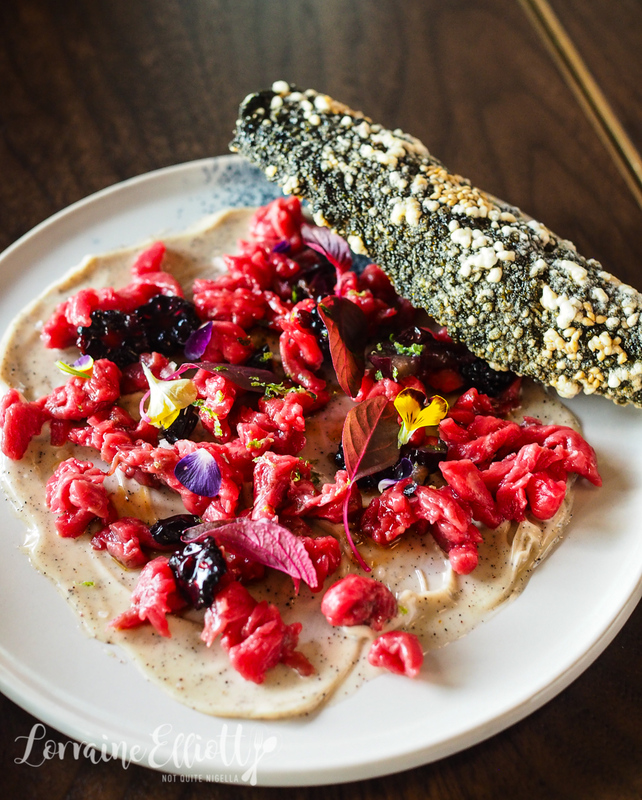 We have to call him back to explain the dish to us because it appears to have grapes and blackberries in it which is unusual for a steak tartare. It's made with Angus beef with blackberries and grapes on a bed of Tasmanian mountain pepper mayonnaise. To the side is a tapioca and sesame cracker. The tartare is good although it's a very small portion that's quite spread out and the cracker doesn't quite complement the tartare as it is better on its own. 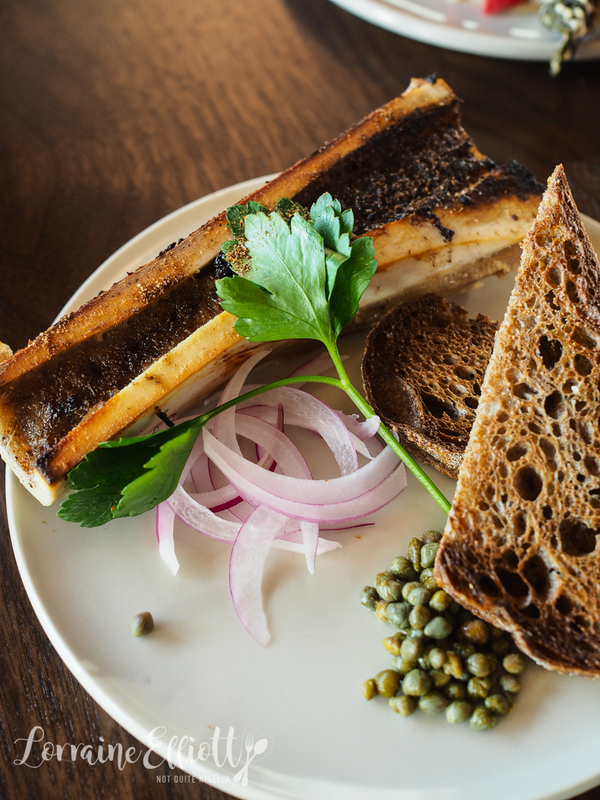 The smoked bone marrow isn't particularly distinctly smoked. It's a single piece of marrow bone with baby capers and red onion and slices of toasted bread. Marrow is always luscious but I think we would have liked two pieces. At this point since we aren't overly hungry so we're just sharing some dishes. The baby kingfish is served on the bone in three pieces including the head. 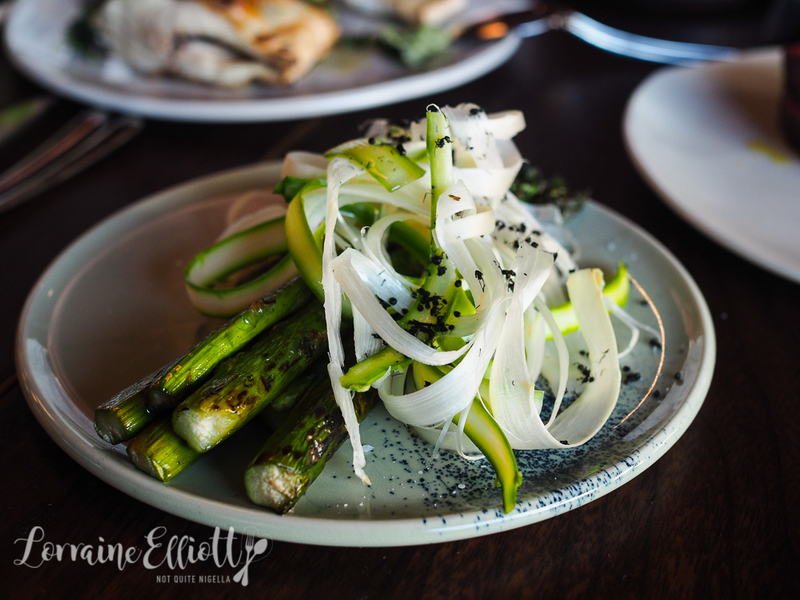 It is rolled in burnt leek ash and there is a centre of sauteed cucumber pieces and some deep fried saltbush on the side. 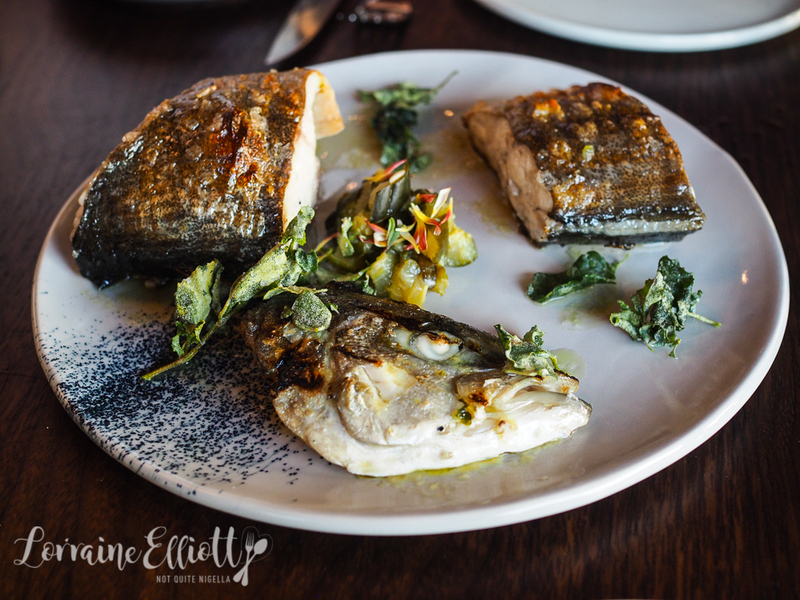 I would have loved more saltbush to season the fish with every bite. The plates are actually quite small which would lead the eye to believe that the serving is bigger than it is (although the stomach can always tell ;) ). I preferred the tender eye fillet of Rangers Valley beef. It's served sliced in half horizontally and it is rolled in a powder of native herbs and served with pickled radish. 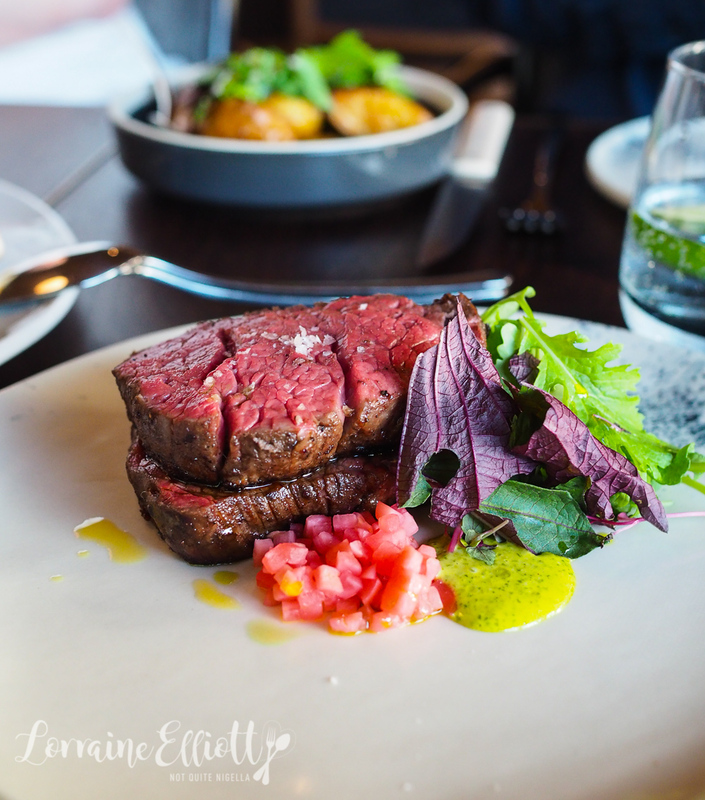 It is sublimely tender and although eye fillet is not my usual choice, it pairs well with the potatoes below. Ryan had to look up what tyrant ants look like. It turns out they sort of look like black sesame or nigella seeds. The asparagus is heavily smoked which really makes us even forget that there are tyrant ants on the logs of asparagus. 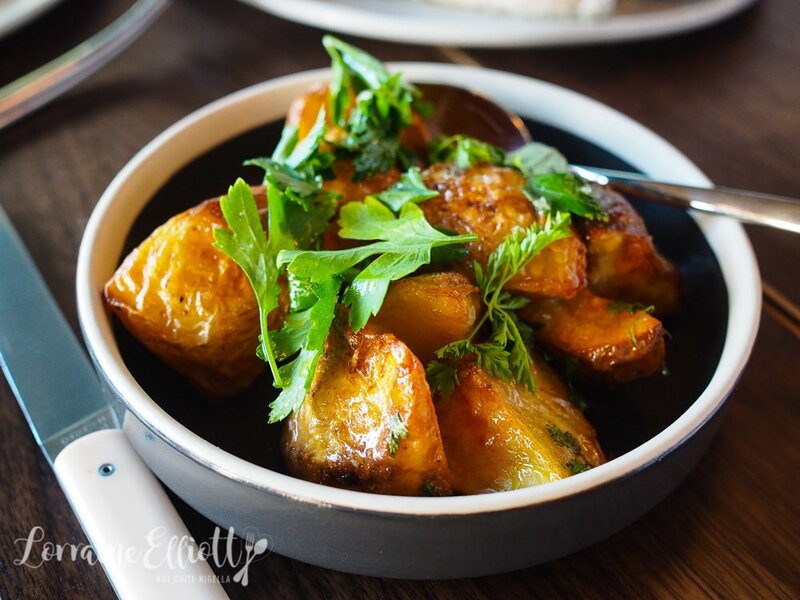 The perfect pairing for the eye fillet is the wood fired potatoes that are crispy with the perfect amount of seasoning on them. The whipped brown butter isn't particularly apparent as there isn't the distinctly nutty flavour. Our soft spoken waiter recommends two desserts for us. 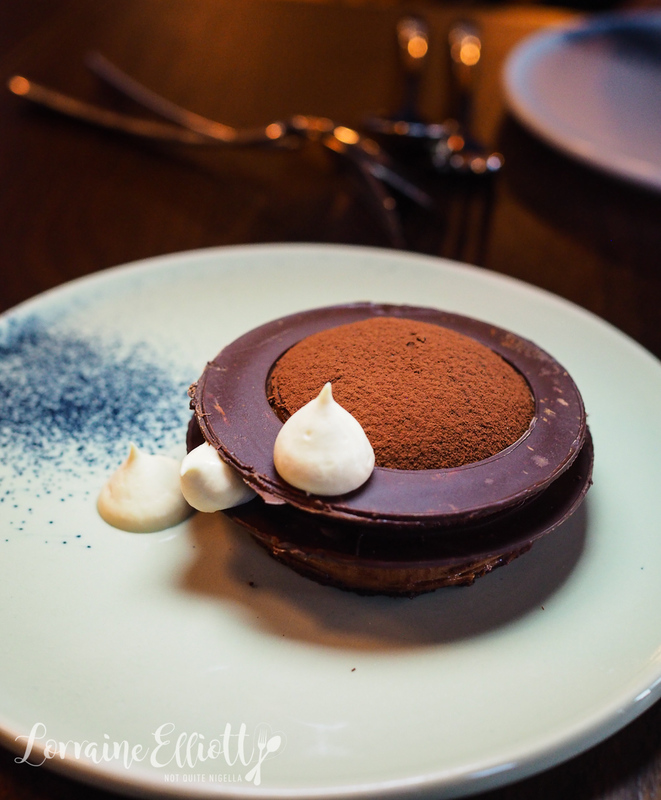 The first is a chocolate caramel dessert. Described as chocolate and caramel it is quite simply flavours of chocolate and caramel. I think I was hoping for more texture to this or a more elaborateness with it. I think it is supposed to look like the building. 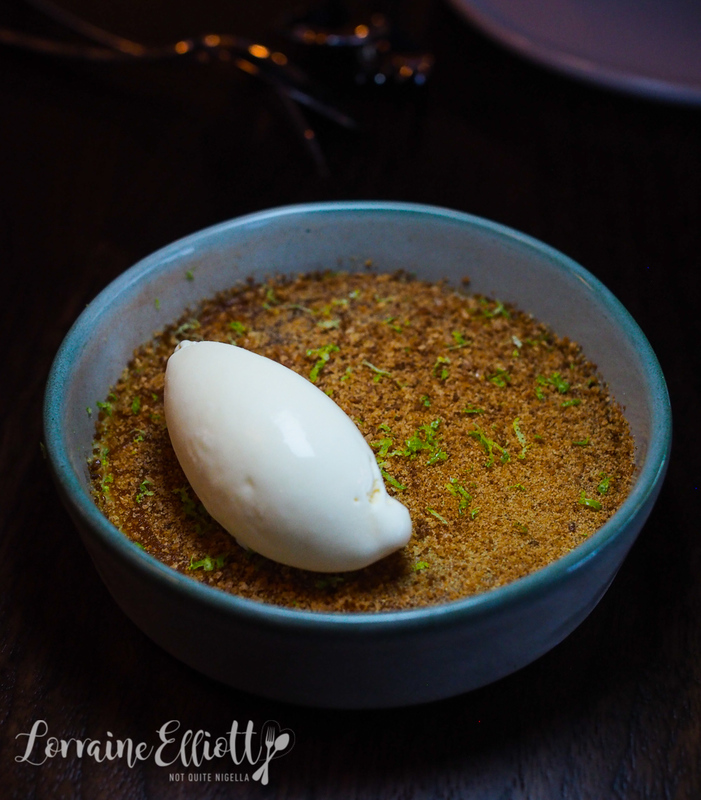 The bigger hit was the lime custard with a layer of thin toffee and a quenelle of tangy, creamy ice cream. It reminds Ryan of key lime pie (which we were literally discussing, do you ever talk about food while you are eating food?) and is our pick of the two desserts. So tell me Dear Reader, what do you think of sea urchin? And what food is a hard no for you? And do you ever talk about food while you're eating food?